DISSING+WEITLING, in cooperation with COWI and Hasløv & Kjærsgaard, have prepared various proposals for the new Storstroms bridge between Masned Island and Falster. A coherent and clearly perceptible expression of form, strongly expressed through the design of the main span as an iconic element. The preferred solution is a new, combined railway and road bridge. 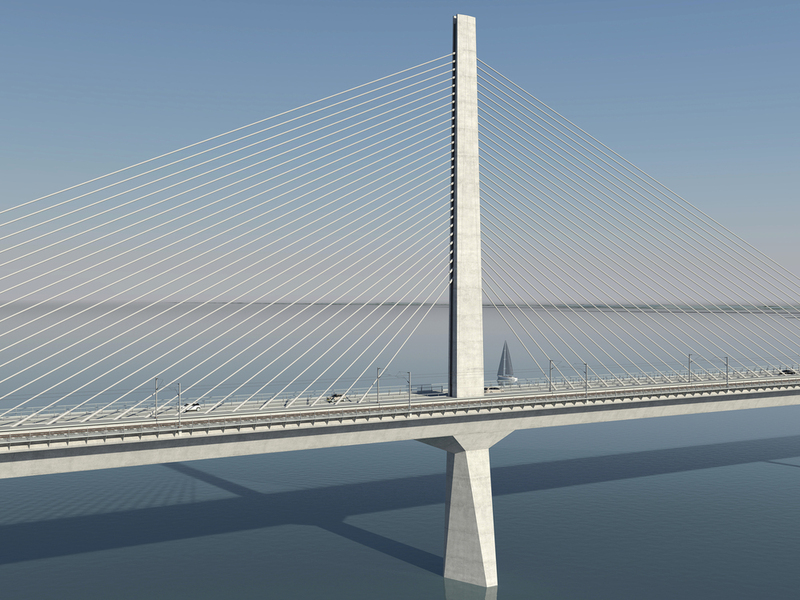 The design proposals, including a cable-stayed bridge and a beam structure, are characterized by a holistic design approach and the desire for continuity of aesthetic expression between all elements of the link. A coherent and clearly perceptible expression of form, strongly expressed through the design of the main span as an iconic element. The gently curved alignment compliments the surrounding landscape, but also forms a dynamic shape that connects the two shores of Masned Island and Falster. On both sides of Storstrømmen, the simple and understated design of the bridge’s abutments is a response to the topographic fragile context. The design of the bridge gives the impression of a robust and simple structure, which also appears elegant and simple for those crossing or viewing the bridge. alongside the bridges in Denmark and the rest of the world. DISSING+WEITLING er arkitekter på det hold, der har udarbejdet løsningsforslag til en ny bro over Storstrømmen mellem Masnedø og Falster. Et sammenhængende og meget synlig formudtryk, der ved broens spænd skaber et ikonisk element. Designet af de to løsningsforslag, henholdsvis en skråstagsbro og en bjælkeløsning, er karakteriset ved en holistisk tilgang og et ønske om en overordnet designmæssig og visuel sammenhæng mellem broens enkelte komponenter. Dette kommer stærkest til udtryk i hovedspændene, hvor der er arbejdet med skråstagsbroen og bjælkebroen som konstruktive og ikoniske elementer.